Once again, I joined David Solnit's art team to make portable images for the Coalition of Immokalee Workers, this time to support their 200 mile March for Rights, Respect and Fair Food across Florida, to the corporate headquarters of Publix, a major supermarket chain still refusing to sign on to the CIW's Fair Food Program. 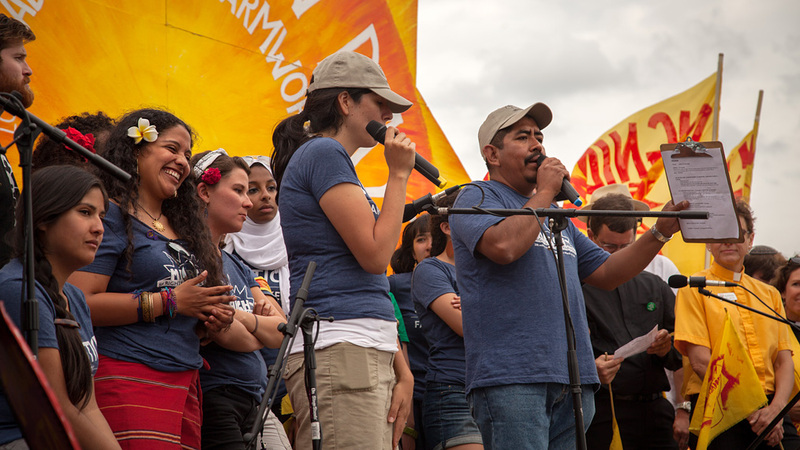 The march was also a celebration of the CIW's many victories in 13 years of struggle. Among the many events marking the last day of the march, the farm workers staged a "mística" - a mute allegorical theater practice originating from the Brazilian landless movement - which narrated the CIW's 13 years of struggle. 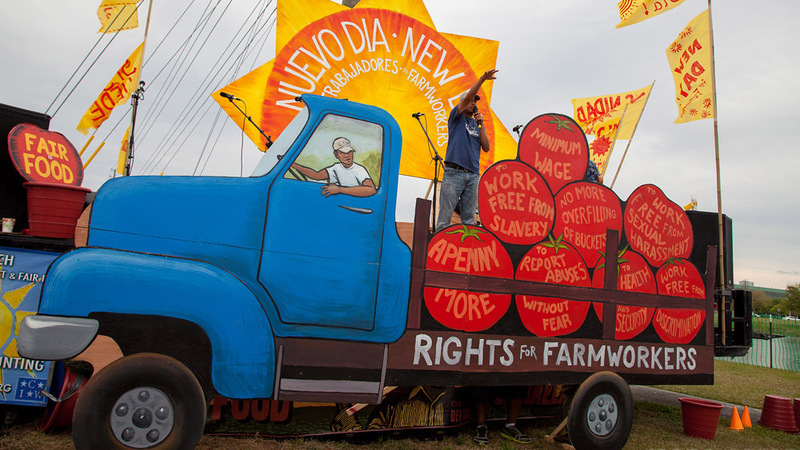 The main image of the theater's allegory was the truck of farmworkers' rights being stuck in a ditch, carrying the 8 tomatoes of basic rights fought for in the CIW's campaign for fair food. The actors then wordlessly narrated the CIW’s history, describing how they made alliances with student- and faith-based groups, then their first unfruitful negotiations with big transnational agribusiness, and finally their sequence of victories in getting the biggest buyers from said multinationals to sign on to the Fair Food Act, one by one: from Taco Bell, to the rest of the fast food giants, and many of the biggest Supermarket chains, including a reluctant Whole Foods. 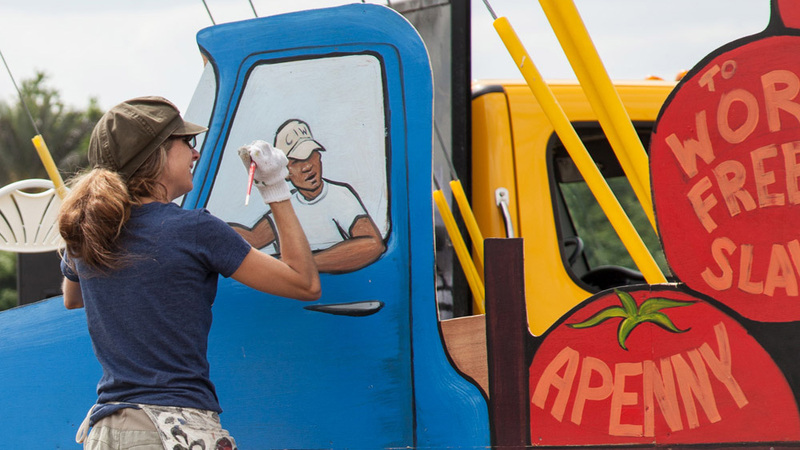 In the play, as they each signed on, these corporations joined the workers in pushing the truck of farmworkers’ rights out of the ditch.... except for Publix, an East Coast Supermarket chain who is among the last to refuse, and in front of whose corporate headquarters this theater piece was performed. 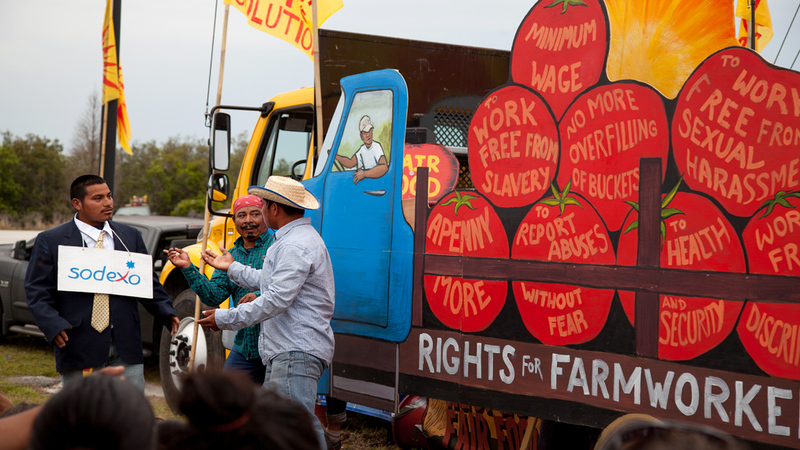 What was truly remarkable was how the farm workers directed this wordless theater with great emphasis on conveying an accurate description of the specific reaction, and attitude during negotiations, of each of the corporations the CIW has dealt with over the years. Watching the rehearsals, in which they remembered lived anecdotes to define each character's physical expression, was an unforgettable piece of oral history. It was an honor to be able to contribute to it by painting the sets and masks. We also made banners and flags for the march. The amazing Santiago Mazatl designed the blue banners, and David Solnit and I got lots of help from Katherine Ball, Emiko Soltis, Ana Ratner, and many who also jumped in. 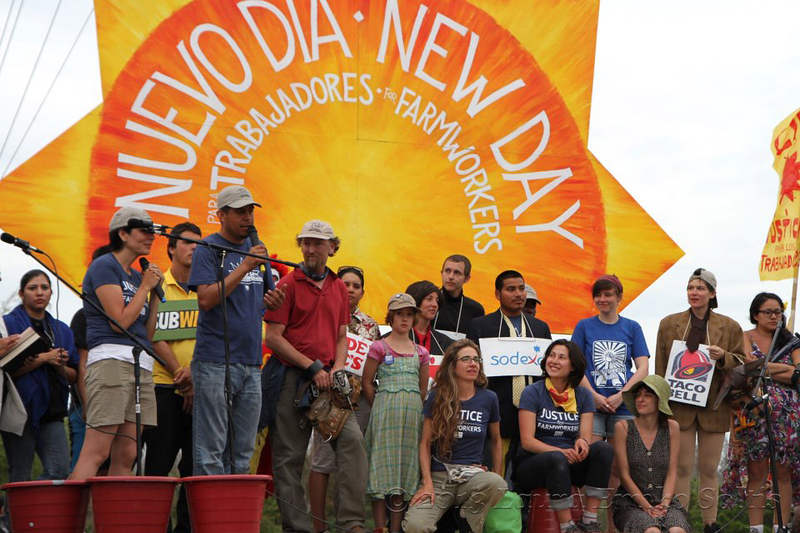 CIW founder Lucas Benitez: ""It is not a question of whether we will win, but when. And when we do win, we will not only help free workers from oppressive conditions in the fields, but we will also free Publix from the impossible burden of supporting and justifying that oppression."